A close-up head and shoulders portrait of a boy wearing a white shirt and beaded neck ornament. The thatched building just visible to the right is probably associated with the American Presbytarian Mission station building at Nasir. Note on print reverse ms pencil - "1 198 "
Morton, Chris. 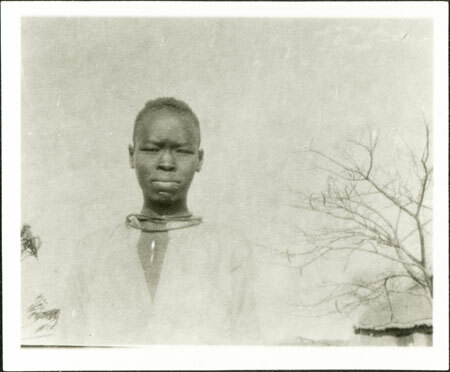 "Nuer boy" Southern Sudan Project (in development). 03 Jan. 2006. Pitt Rivers Museum. <http://southernsudan.prm.ox.ac.uk/details/1998.346.198.2/>.